Solace Hair and Esthetics owner Sarah Barrett and her staff have gained a reputation for their dedication to their clients and to providing them with high quality hair and skin care. They welcome everyone to visit the salon and experience the peaceful and relaxing environment. Solace specializes in precision cutting, advanced colouring techniques and corrective work. We proudly use Infinity Sulphate free low & non ammonia colour. This colour line is a great alternative for the perfume and ammonia sensitive, or for those of us looking for a more beautiful, dependable & forward thinking colour care line. Always concerned with the environment, Solace uses and carries the professional organic product line, Kevin Murphy, which is sulfate free and cruelty free. Our recent addition to Solace is our facial line called Moor Spa, which is 100% organic. Clients can choose from a wide variety of esthetic services including massages, facials, sugar/waxing, manicures and pedicures. The Solace team would like to thank all of their faithful clients as they go into their fifteenth year of business . We invite everyone to sample the creative talents of Artistic director Sarah Barrett. Sarah Barrett has gained a reputation for her genuine care and dedication to her loyal customers! 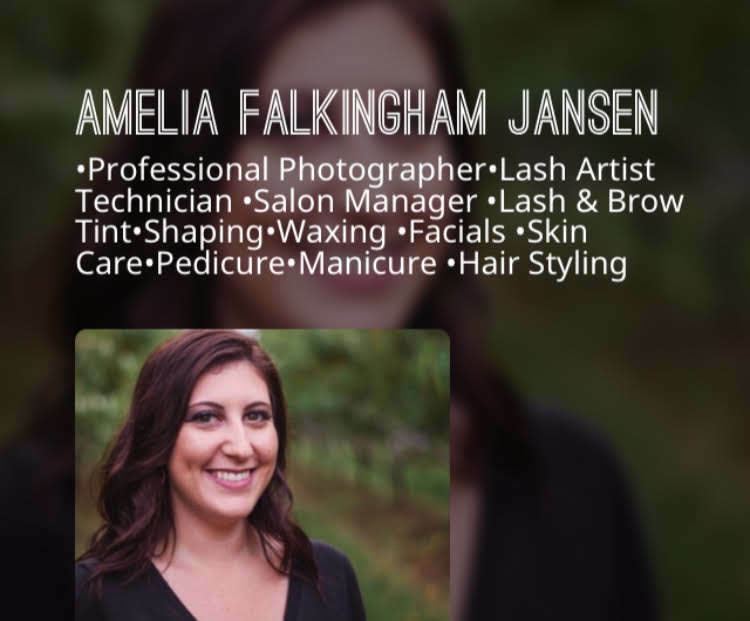 Relief from the “daily bombardment of chemicals and life’s stresses” is the basic principle behind her choice of name for her Thorold Salon and her choice to use low & non-ammonia-free and sulphate-free products for hair & skin care such as Kevin Murphy, Neuma and L’Moor, Moor Spa! With over 28 years in this Artistic Industry Sarah has trained under Canadian, African, American, European and Chinese educators. Specializing in precision cutting as well as Corrective Colour. Extensive training at Partners Hair Company (80% African styles) and experience working with Asian hair out West (Alberta) has helped to broaden her specific skills. Teaching colour Correction on the road for 3 years to other stylists and in her Hair Studio for over 18 years as Owner and Mentor. Since a very early age Sarah was taught the importance of giving back to the community in her faith in the Creator and simple kind acts which reflect her choice in like minded staff and ongoing care for others. “It’s wonderful to help others around the world, but let’s not forget those in our own backyard”. Please check regularly on Facebook and Instagram for fun contests and special events! Since opening her doors, her business has supported well over 300 charities and causes. From Alberta’s Fires to local schools and community care. Sarah is comfortable working with naturally curly to “impossibly straight” hair. 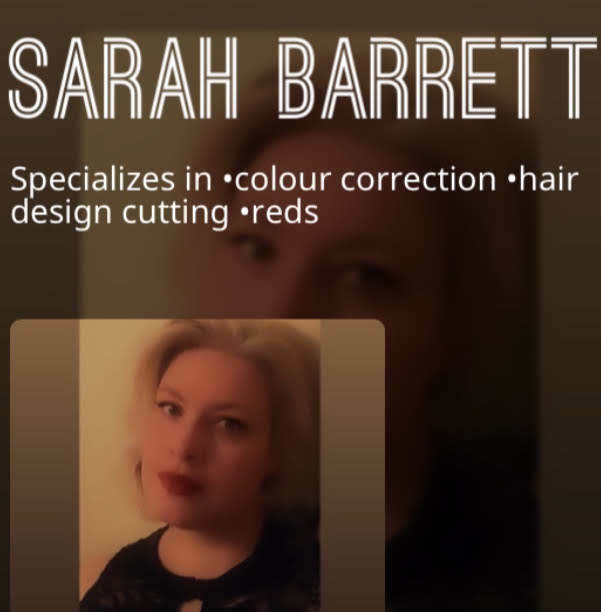 In her career, Sarah has worked in or attended countless trade (Back stage for TBBS Pureology and Natrique as a hair colour artist) and bridal events (8) from Alberta to Newfoundland. One project was maintaining some of the actors hair for the movie, Last of the Dogman, which was filmed in Canmore, Alberta. From the big screen to the humble stage, Solace stylists have done the hair for actors in the V Monologues performed in Niagara, namely Cindy Williams and Sue Johanson. Sarah has participated in over 7 photo shoots during her career, 4 of them displaying her work! (One of her favourites was a vintage inspired photo shoot showcasing 30-70’s hairstyles). What’s next for Sarah Barrett and the Solace Team? This year they celebrated 18 years in Niagara! Have you heard the buzz about words like Balayage, Foiliage, Ombré, Sombre, Babylights, Shadow, Colour Melts, Vivid, Platinum and more! Come visit our Studio to find out the latest. Call to book your appointment today! 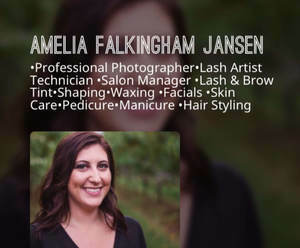 Amelia Falkingham Jansen grew up in beautiful Durham, which gave her a deep appreciation for nature which is evident in her passion for photography. Many weekends are spent exploring or hiking and spending time with family and friends. She especially enjoys spending time with her husband and her pup Shaddy. They are also looking forward to expanding their family through adoption. Amelia specializes in Classic, Hybrid & Volume lash extensions. She is also trained in Lash lifts and Tints and specializes in brow shaping and facials. If you are looking for a lash artist that pays attention to detail and what’s right for her individual clients she may be the right visual artist for you! Feel free to check out her Instagram Page or her Facebook Page! Robyn Barrett has been part of the Solace team for over 8 years! Early on, getting to represent her school in competition! 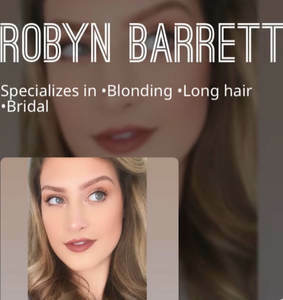 Robyn specializes in bridal hair on and off site and lightening techniques. Feel free to check out her Instagram Page! She loves making people happy! She also does aesthetics, scalp renewal treatment, facials, artistic brow shaping, shellac and makeup! She takes pride in her work and knows she’s doing her job from the smiles she gets from her guests. When not doing hair, Robyn is busy with friends and family. Devoting time to others. (Her volunteer work is very important to her, both locally and in her travels). Spending a great amount of time outdoors hiking and exploring new places is a great rejuvenator. Her other loves include traveling to new places, Ollie & Maisie (her two cuddly cats), unwinding with great music and a favourite movie! Kristie Harris loves the feeling you get from a small town community, growing up in Crystal Beach. She now resides in beautiful Fonthill. She has been creating hair dreams for over 20 years, enjoying all aspects of hairstyling! She has gained experience from classes, Bridal shows, being part of a Mobile Bridal Company, having her own Salon, taking part in V Monologues for Women’s Place (now Gillians Place) as well as other stage work for hair. 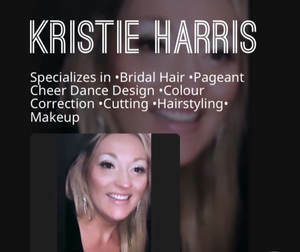 Kristie has plenty of experience in upstyling hair for brides in NOTL and the GTA as well as locally, beauty pageants, dance and gymnastics. Kristie has a great compassion for people and this is shown through her passion for helping others in different ways. She has volunteered 12 years in the social services field. She also has volunteered for The Time of our Life Fashion Show Cancer Fundraiser, doing hairstyles for the women. With her family’s support she has decided to return to school at the age of 36 to pursue a career in the social work field while continuing her first passion as a hairstylist. Kristie has 3 beautiful children and family is incredibly important to her. She loves spending time with all of her loved ones. She has always instilled in her children to be kind to everyone. 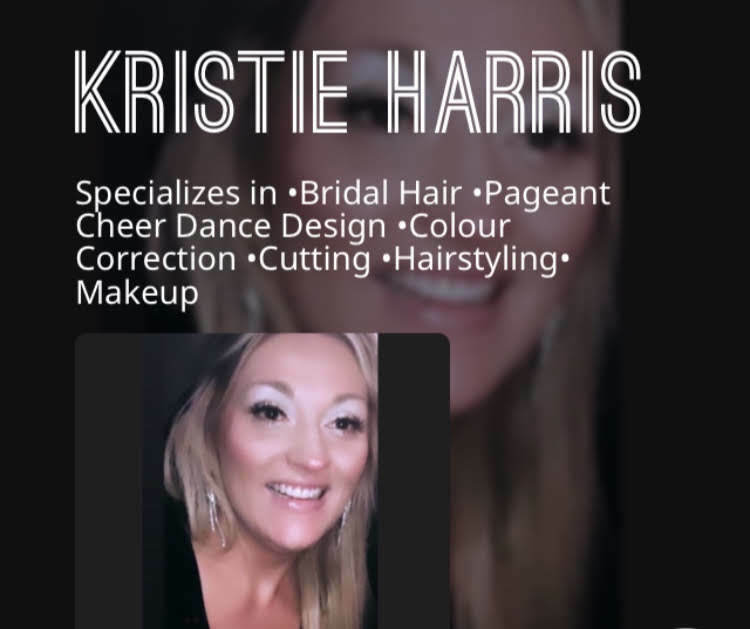 Kristie loves the creativity that is involved in being a hairstylist. 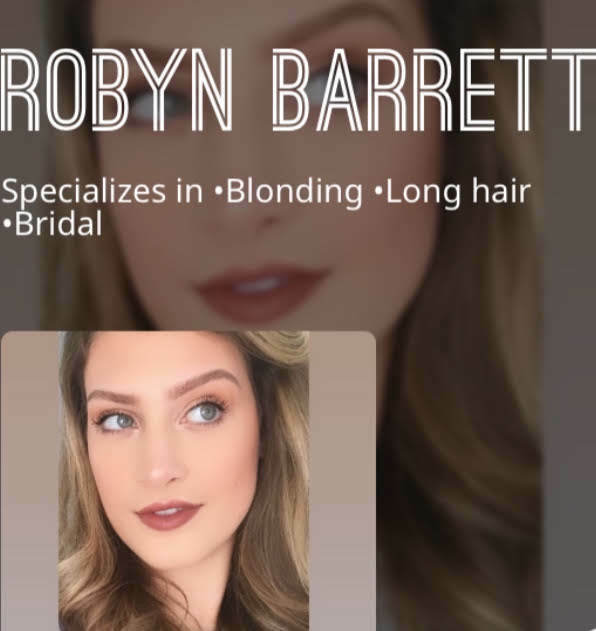 She enjoys the challenges that comes with colour corrections, staying on top of all the newest trends and of course the end result when the clients walk out feeling amazing! 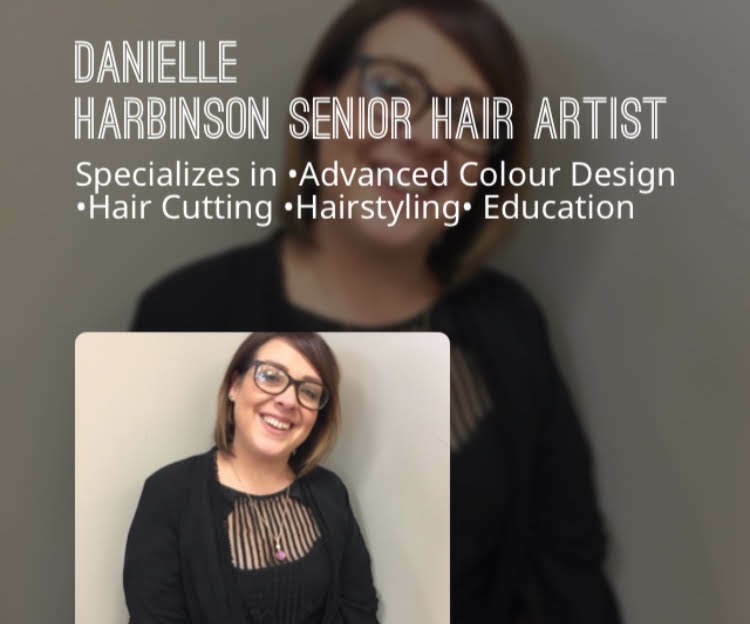 Danielle Harbinson is a Senior Hair Artist from Belfast, Ireland! She’s been creating hair dreams for 17 years! And as a previous Salon Owner and Instructor, she is more than qualified! 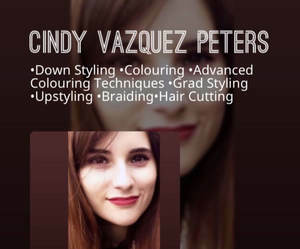 With her friendly, outgoing personality and great passion for her craft, she welcomes any to come by and book a fresh style! She adores autumn and all the changing colours. A huge dog lover (especially her wee man Oscar). To relax, she enjoys a good read with a glass of wine and some delicious Irish and Italian flare! Danielle is always up for learning new things, it shows in her great gift as an Educator. Her attention to detail whether in colour or her favourite, in creating beautiful cuts! She loves to see the way a clients hair changes in appearance! She is grateful to have the opportunity to be part of such a great team! Spending a lot of her time with family and cherished friendships. On weekend she keeps busy making new friends and trying new things. Cindy devotes a lot of time volunteering! As a Solace team member for almost 3 years, she is one of our hardest working employees who is a stickler for getting things just right! She is very precise with colours & cuts and this shows in her work. Her favourite thing about hair has always been styling, since there are so many different and creative ways you can do it. Megan Bird is working towards Hair and Aesthetics as an apprentice and personal assistant! She’s had a gift for all things beauty since she was a little girl. Attention to detail is primary! 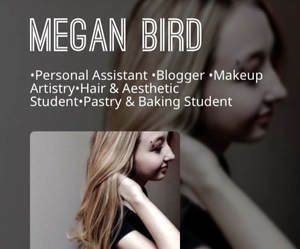 Creating her newest makeup video, food blog and YouTube video as a baker (her other passion). Her favourite food to bake and also eat are cookies. Although we all love her cookies, the cake pops are next level! Since 2017 Megan has been part of our Solace team. She views us as family. The feeling is mutual. We love Megs tender heart and thoughtfulness! Newfoundland is her favourite place to visit because it’s beautiful and her family is from there. Megan loves summer. During the warmer weather she enjoys her hikes! (Not our cold weather) Family movies and spending time with her dogs, Roxie & Shelby, cuddles from her cat Lucky and can’t forget her fish Bee.